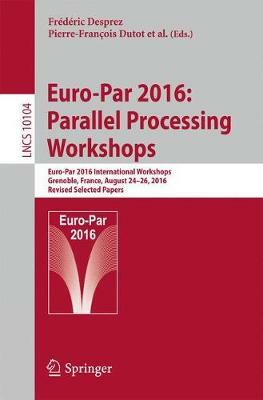 This book constitutes the proceedings of the workshops of the 23rd International Conference on Parallel and Distributed Computing, Euro-Par 2016, held in Grenoble, France in August 2016. The 65 full papers presented were carefully reviewed and selected from 95 submissions. The volume includes the papers from the following workshops: Euro-EDUPAR (Second European Workshop on Parallel and Distributed Computing Education for Undergraduate Students) - HeteroPar 2016 (the 14th International Workshop on Algorithms, Models and Tools for Parallel Computing on Heterogeneous Platforms) - IWMSE (5th International Workshop on Multicore Software Engineering) - LSDVE (Fourth Workshop on Large-Scale Distributed Virtual Environments) - PADABS (Fourth Workshop on Parallel and Distributed Agent-Based Simulations) - PBio (Fourth International Workshop on Parallelism in Bioinformatics) - PELGA (Second Workshop on Performance Engineering for Large-Scale Graph Analytics) - REPPAR (Third International Workshop on Reproducibility in Parallel Computing) - Resilience (9th Workshop in Resilience in High Performance Computing in Clusters, Clouds, and Grids) - ROME (Fourth Workshop on Runtime and Operating Systems for the Many-Core Era) - UCHPC (9th Workshop on UnConventional High-Performance Computing).